Introducing vaccine-related legislation is the political equivalent of swatting a hornets' nest. Regardless of what the legislation does, it's guaranteed to bring out emotional and passionate advocates. That was the case Feb. 18, when a bill requiring medical professionals to give more information before immunizing a patient had a hearing in the Senate Committee on Health Care. The bill is seen as supporting so-called "anti-vaxxers," alalthough supporters say the goal is to provide more information. Federal law requires parents and patients receive a sheet from the Centers of Disease Control and Prevention. It distills the benefits and risks of getting vaccines to two pages in a way that's supposed to be understandable for the average parent. But those sheets don't include other information, such as the ingredients in the vaccines. Senate Bill 649 would change that. It would require the Oregon Health Authority to maintain a webpage with information on the ingredients of vaccines and their dangers. That same information would be given by medical professionals to patients in a packet before a child is vaccinated. The bill was introduced on behalf of Oregonians for Medical Freedom, an advocacy group that opposes mandated vaccines and doubts their safety. It is sponsored by state Sens. Kim Thatcher (R-Keizer), who represents Newberg, St. Paul and parts of Dundee; Dennis Linthicum (R-Klamath Falls); Tim Knopp (R-Bend); Brian Boquist (R-Dallas), who represents parts of Dundee; and state Reps. Mike Nearman (R-Independence); Ron Noble (R-McMinnville), who represents Dundee; and Duane Starpartsk (R-Grants Pass). Vaccinations have been successful in eradicating dangerous diseases, such as measles. During the past two decades, skeptics about the safety of vaccines have grown into a small but vocal movement. There are fears that vaccines can cause autism, although that theory repeatedly has been debunked by researchers. When unvaccinated rates climb to 10 percent or higher, the risk of an outbreak greatly increases. Nearly all who've contracted measles during the recent Vancouver, Wash., outbreak were unvaccinated. The measles vaccine is 97 percent effective, according to the Centers of Disease Control and Prevention. Sarah Bacon, executive director of Oregonians for Medical Freedom, told the Senate committee that the goal was to give patients the kind of medical information someone would get with other medications, such as insulin. But a panel of doctors oppose the legislation, saying this was a scare tactic and a way of confusing parents. The existing federal fact sheet is easily understood and a large packet with page after page of medical jargon won't help inform anyone, they said. An example is the ingredient list the bill would require doctors to give patients. Paul Lewis, a Multnomah County health officer and a pediatrician of 31 years, said the list includes formaldehyde, a chemical used in embalming. A reasonable person could see that as dangerous. "Your body continuously produces, and eliminates, formaldehyde," Lewis said. "The trace amount of formaldehyde present in some vaccines is far less than the amount already present in the body. Any small amounts of formaldehyde in vaccines is promptly detoxified and excreted. "The implementation of this bill will frighten parents about a naturally occurring chemical and burden health care providers with having to give a lengthy explanation about a vaccine component with no health risk." Paul Cieslak, medical director for communicable diseases and immunizations at the Oregon Health Authority, said giving a list of potentially dangerous ingredients without saying the level at which they become dangerous is misleading. "You can't divorce chemical from the quantity when you're trying to consider how harmful it is," he said. The bill received written testimony from 59 people. After expert testimony, 23 citizens signed up to speak, although there was only time for a handful to talk for a minute each before the hearing ended. The crowd was lively, with people often dramatically shaking their heads at testimony from the doctors, and at times verbally objecting to Lewis' statements. The issue is popping up at a time when vaccinations are on the minds of many Oregonians. A measles outbreak in Washington has 66 confirmed cases. Washington and Oregon public health officials and political leaders have called on citizens to get vaccinated, saying it's the most effective way to prevent outbreaks. "At a time when we are responding to the largest measles outbreak in the 22 years I've been in Oregon, I think anything that contributes to the fear of parents, inaccurate information about vaccines, we should oppose," Lewis said. The bill has no further scheduled testimony, but if it moves out of committee it will likely need some amendments, according to testimony. Part of it conflicts with state law outlining when a teen gets autonomy over their medical decisions. The legislation doesn't say whether the new vaccine information would be given in physical form or patients would get the website address. One witness said the group was asking for a one-page document with instructions to find more information online, but that isn't reflected in the bill. Jonathan Lockwood, spokesman for Thatcher and Linthicum, said Thatcher was looking at an amendment to the bill to clear that up. Lockwood said Thatcher has worked with Bacon and Oregonians for Medical Freedom for several years and the bill is not motivated by an anti-vaccination mentality. "I think the biggest thing is people just want access to the same information they would have with optional drugs," he said. Senate Bill 649's controversy is likely just a preview of what may happen with House Bill 3063, introduced Feb. 22 by state Rep. Mitch Greenlick, which would remove nonmedical exemptions for kids in public schools. Right now, parents with children in public school can claim a religious or philosophical exemption to vaccinating their children. Under Greenlick's proposal, the only way to avoid vaccinating a child headed to school would be with a doctor's note stating there is a legitimate medical reason to avoid vaccinations. Parents against vaccinations could still home-school their children. Greenlick (D-Portland) said he knows he's stepping into controversy, but his proposal is backed by the best available science. He said having a philosophical exemption to vaccinations is "ridiculous." "I think we've reached a level that's far too dangerous in terms of people who've exempted themselves," he said. The Oregon Health Authority usually does not take a stance on legislation outside of concepts put forth by the agency, and has avoided taking a stance on other vaccine-related bills. The agency diverted from the norm when saying it supports Greenlick's bill, calling it evidence-based and something that will protect the public. 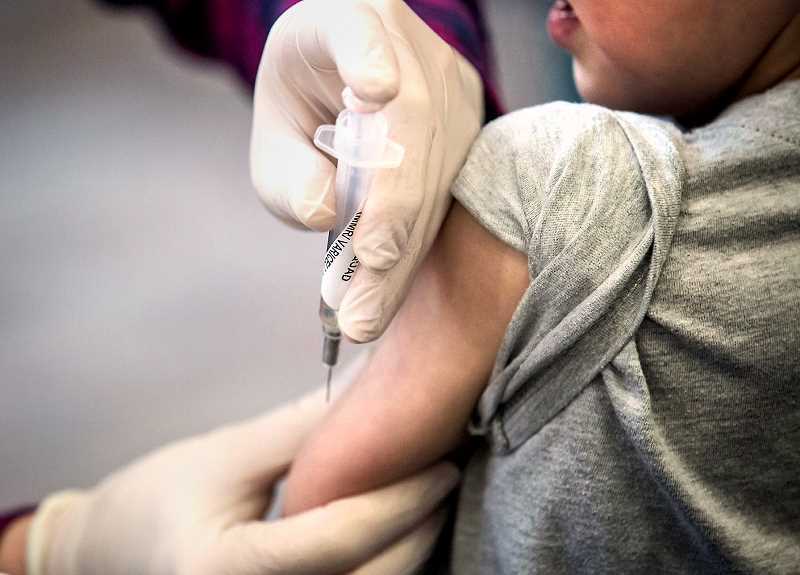 "Oregon's 94 percent childhood immunization rate leaves too many schools and communities lacking the resilience they need to safeguard against preventable disease outbreaks — and the harms these outbreaks can cause," said OHA spokesman Robb Cowie. "Aligning our state's immunization laws with less permissive laws in other states will increase vaccination rates here in Oregon and protect more people and communities." A similar effort failed in 2015, but Greenlick said the measles outbreak in Vancouver has made a theoretical problem a real one and he thinks this time legislative support will be there. He said he's taken hundreds of calls, evenly split in favor and against tightening vaccination exemptions, before introducing his legislation.